2013 Road Trip Photos #4: Travel Bits from Day One « Midlife Crisis Crossover! The bulk of Day One was a repeat of our Days One from several previous vacations: barreling through the vast expanse of Ohio with minimal stops so we can reach the states beyond. The only Ohio stop that left an impression was lunch in Dublin at a chain called Jason’s Deli (which we don’t have back home). I liked their heated lunchmeat fare more than my family did, but their mostly teenage staff weren’t quite focused on service. When we needed a box for leftovers, I stood at the counter for a few minutes watching half a dozen employees crowded behind the same counter all chatting, teasing each other, fiddling with supplies, or otherwise too preoccupied to afford me the courtesy of a simple “May I help you?” till I lurched closer to the counter and raised my voice. We’ll be skipping Jason’s on future road trips, then. 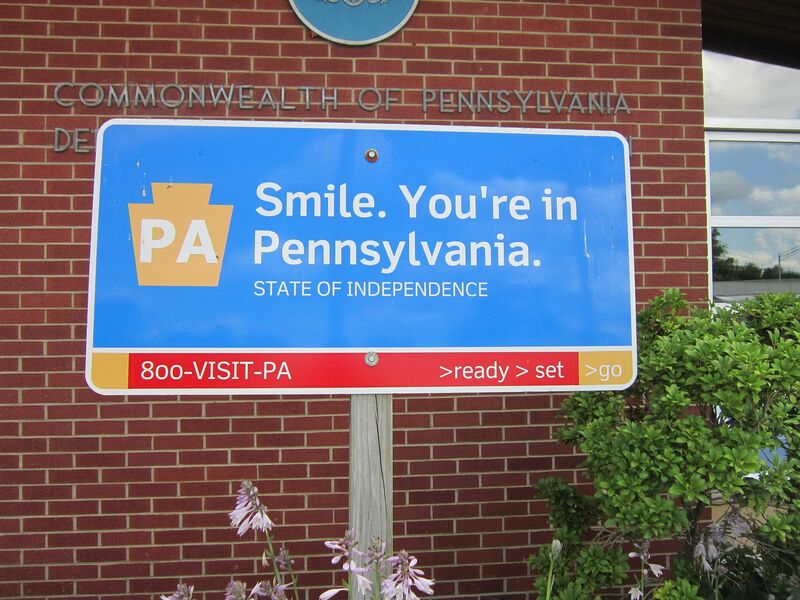 Unlike that motley crew, Pennsylvania certainly seemed happy to welcome us, once we were free of Ohio’s clutches. 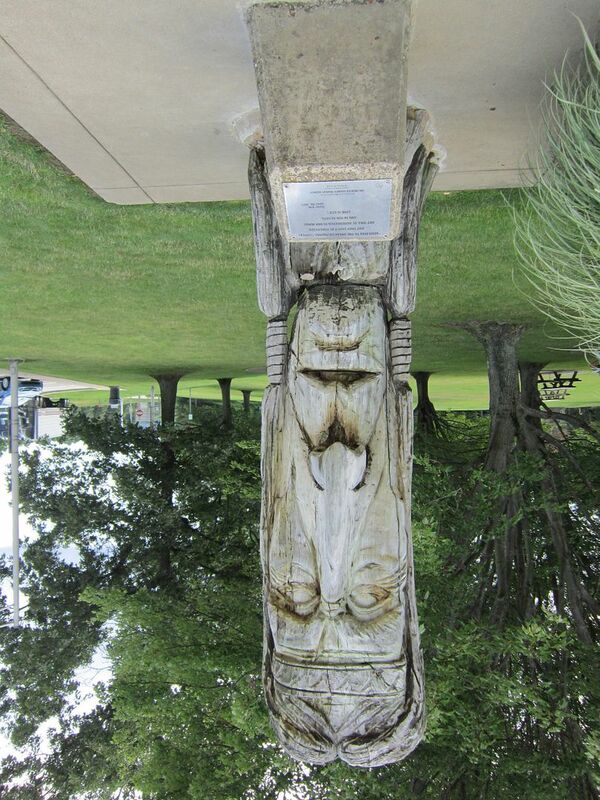 Also at the Pennsylvania welcome center: a 1973 wood-carved salute to the Seneca tribe by sculptor Peter Wolf Toth, or possibly a small-scale replica of a much larger sculpture. We found little context onsite. When we finally reached our hotel in Dubois, our first impression was flat-footed awkwardness. The building seen here is the main hotel structure containing the front desk, most of their rooms, and the all-important breakfast buffet. 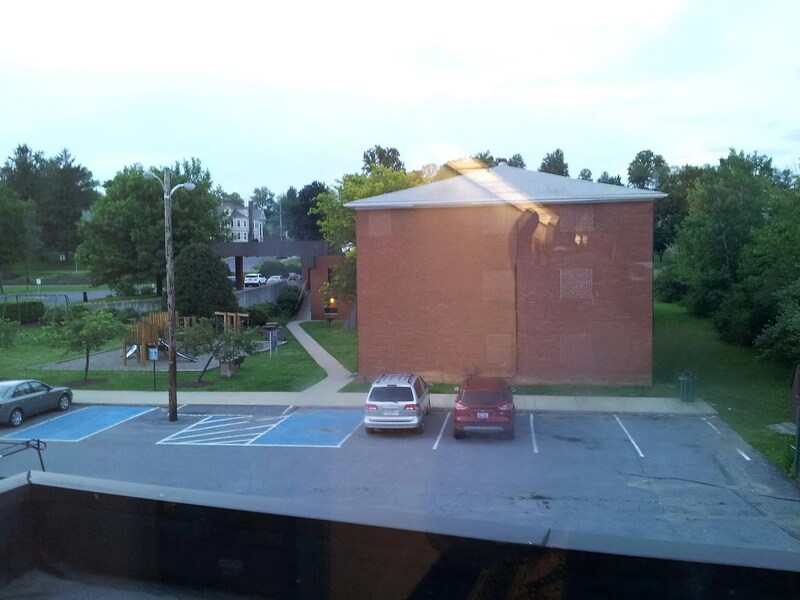 This photo was taken from the detached building out back, containing their conference center and a handful of extra rooms on the second floor, including ours. Whenever we reach our intended hotel for the night, our unanimous family procedure is to grab all our luggage out of the car and carry everything inside with us at check-in. We have no dire need for luggage carts or bellhops. We travel lightly compared to other families. Even if we didn’t, we’re able and willing to heft twice our maximum carrying capacity for a few minutes if it means we don’t have to make multiple trips back and forth to the car. With our suitcases, duffel bags, backpacks, and small cooler in tow, our spirits sank a little when the clerk informed us we’d be staying in the other building, which was distant enough to warrant its own separate parking lot. We weren’t about to toss everything back in the car, drive down there for convenience, and drag out all our luggage again. That would technically count as two trips, and that’s not happening on our watch. Once we had our room keys, we exited the front door, descended the lengthy staircase down the hillside, past the playground, across the back lot, and into the conference center, whose special bonus features included neither an elevator nor any A/C or ventilation in the stairwells leading upward and onward to our second-floor destination. As we collapsed into the furniture under the weight of all our stuff, we were pleased to note the room itself was mercifully flawless. I tried to focus on that happy ending as I trudged back to the main lot and fetched our car. 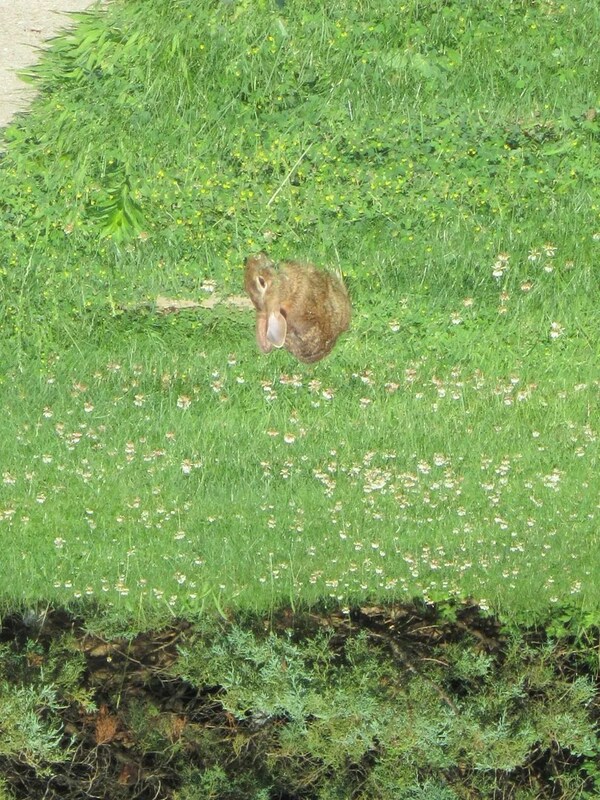 One feature attraction the hotel website didn’t mention: cute, fuzzy, widdle wildlife neighbors. Behold: FREE BUNNY! 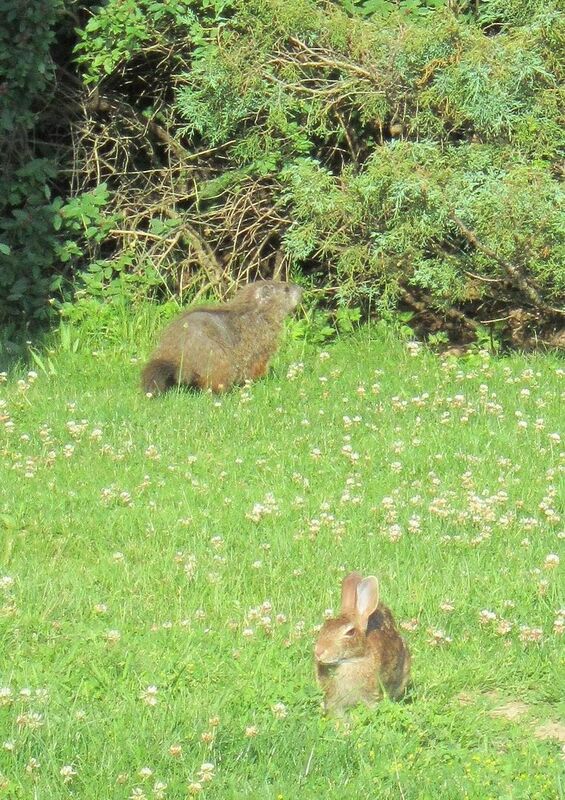 Free Bunny welcomes his very special guest, FREE GROUNDHOG! Much livelier than that slacker Punxsutawney Phil. More than one closed business space had signs redirecting customers to their new location: “Moved next to Wal-Mart”. 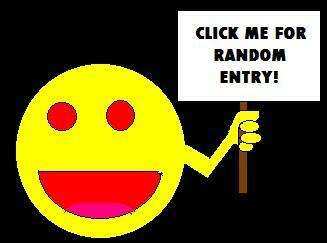 I gather that’s the hot spot where you’ll find everyone who’s anyone in town. The winding, forested highways between Dubois and Punxsutawney are decorated with multiple signs advocating driving safety — some government-mandated, some locally handmade. I was unsurprised at admonitions about speed, aggression, sharp-curve maneuvering, and other tools in the confident driver’s toolbox. Next to a storefront advertising “Exotic Dancers” was an additional sign reading, “My Mommy Works Here! Please Slow Down!” I might be imagining the exclamation points. My wife and son were a little too flabbergasted to take a photo. I would’ve done so myself, but I was too busy adjusting my mental driving setting several notches down to Level Grampaw. I had to think of the children. Next morning, the hotel buffet had pans for breakfast proteins that were mostly empty and a plastic rack for breakfast breads that was over half empty. I trust the staff was toiling in the kitchen in an effort to catch up on production, but I couldn’t help making a face when a manager came out and nabbed himself an English muffin from the dwindling supply for his own gnawing pleasure. So we’ll be skipping this hotel on future road trips, then.